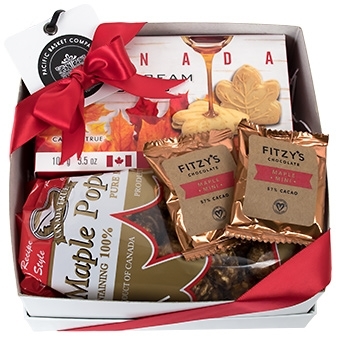 Each box is filled with Canadian treats which includes a bag of Maple Popcorn, a box of maple cream cookies and Fitzy's chocolate maple minis. 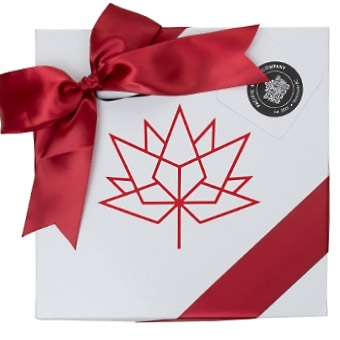 Box size 6x6x3"
The contents of this gift box are carefully arranged in a paperboard box and wrapped in tissue with a closed lid. We decorate it with a beautifully hand tied ribbon and includes a gift card with your personal message. If you select personalized ribbon, the imprinted ribbon with the text or company logo will be tied around the box instead of the regular ribbon we use. All gift boxes and gift baskets on www.pacificbasketco.com are exclusively designed and made by Pacific Basket Company.